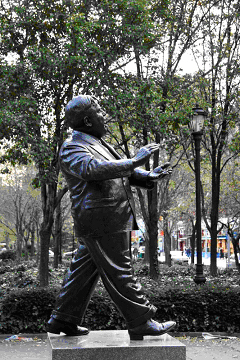 LaGuardia Park, a public park run by the Friends of La Guardia Place in Greenwich Village, featuring a statue of Mayor Fiorello La Guardia and toddler playground. 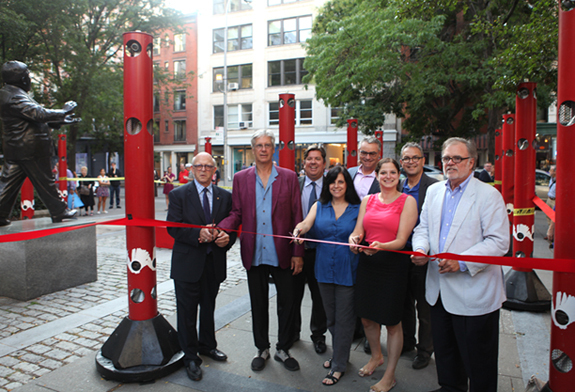 September 5-11, 2014: LaGuardia Park is hosting "Sonic Forest: Civic Celebrations," by artist and composer Christopher Janney, in conjunction with AIA New York and Community Board 2 Manhattan. This world-renowned public art installation features carefully placed "trees" that interact with visitors via sound and visual effects. Each "tree" has sensors; visitors trigger the sensors by touch or movement, producing an ever-changing score of melodic tones and environmental sounds and turning the installation into a “communal musical instrument” enhanced by varying light effects. The score will change according to the time of day and the level of activity in the park, from flocks of frogs and crickets in the morning to marimbas, percussion, and swarms of fireflies passing overhead at night. Sonic Forest: Civic Celebrations never plays the exact same composition twice. 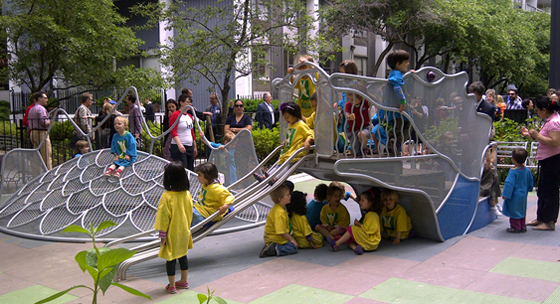 and "Adrienne's Garden," a toddler play area in LaGuardia Park. The Friends of LaGuardia were delighted to celebrate a Grand Opening and Ribbon Cutting June 6, 2013, attended by our elected officials and those who were so crucial in getting this secure and welcoming playground with a friendly dragon that children climb, slide and play on every day! Children discover the new friendly dragon in Adrienne's Garden! 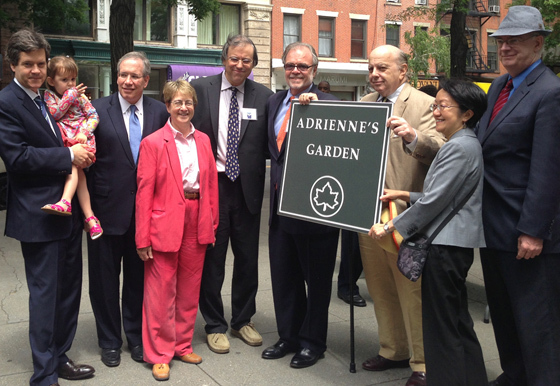 From left: State Senator Brad Hoylman with his daughter Silvia, Manhattan Borough President Scott Stringer, State Assemblymember Deborah Glick, former Councilmember Alan Gerson, President of Friends of LaGuardia Larry Goldberg, Community Board 2 Manhattan Chair David Gruber, Councilmember District 1 Margaret Chin and NYC Department of Parks Manhattan Borough Commissioner William Castro. Friends of LaGuardia is an all-volunteer organization. 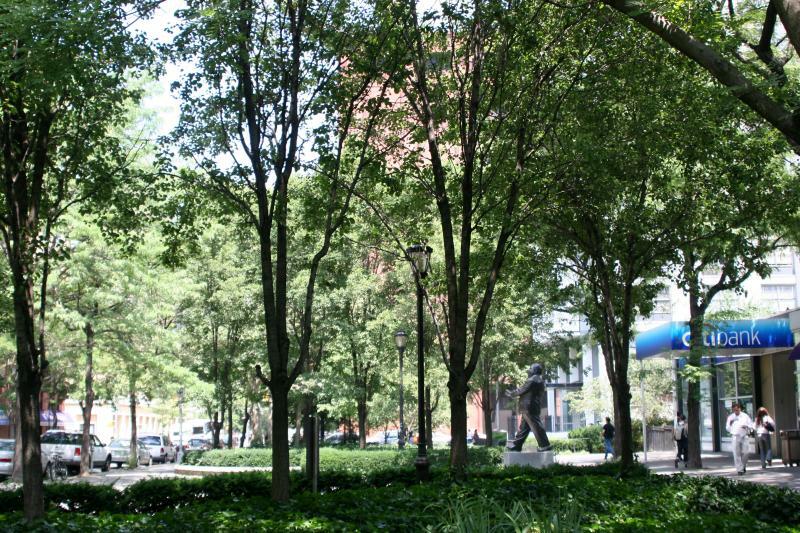 La Guardia Park prior to the construction of Adrienne's Garden in 2012/2013.